NEW YORK (CNNMoney) -- Lawmakers can't agree on anything except ... beer. That's right. Earlier this week, a Democrat joined with a Republican to introduce legislation in the Senate that would lower excise taxes on small breweries. Currently, breweries pay a $7 dollar tax per barrel for the first 60,000 barrels they produce each year. The bill would drop that fee to $3.50, and for production in excess of 60,000 the tax would fall from $18 per barrel to $16. The bill is called the Brewer's Employment and Excise Relief -- or BEER -- Act. Sens. John Kerry of Massachusetts and Mike Crapo of Idaho introduced the measure, and were joined by eight Republicans and nine Democrats who signed on as co-sponsors. 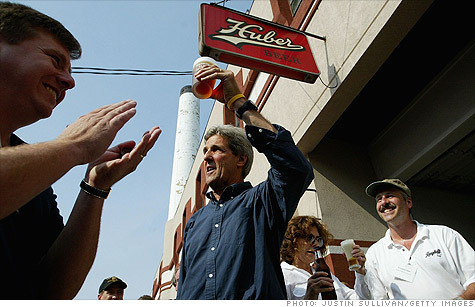 Kerry framed the bill as a way to help small breweries compete against the huge multinational companies that dominate the U.S. beer market. "The craft beer revolution started right here in Massachusetts and they've been going toe to toe with multi-national beer companies ever since," Kerry said in a statement. Congress considered similar legislation last year, but it was never enacted. The bill would also modify the definition of a small brewery, raising the barrel limit from 2 million per year to 6 million. The Brewers Association, a trade group that represents small breweries, made a similar change in definition earlier this year. Nick Matt, chair of the Brewers Association and CEO of F.X. Matt Brewing Company, which brews Saranac, said in January that the change in definition was necessary to accommodate the success of small breweries. "Rather than removing members due to their success, the craft brewing industry should be celebrating our growth." Matt said in a statement. The small brewer federal tax rate was established in 1976 and has never been updated. In addition to federal regulations, small breweries must also navigate a series of famously opaque state and local brewing regulations.